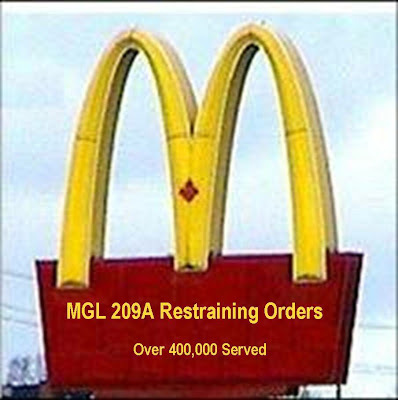 In the last 10 years about 400,000 MGL 209A restraining orders have been issued in Massachusetts. To put that in perspective: According to the 2000 US Census there were 1.9 Million men ages 15 - 60 living in Massachusetts. 400,000 restraining orders represent 1 in 5 Massachusetts men have been served a 209A restraining order. Are we that bad? Should men be outlawed? We should call these restraining orders MC209A's. Like McDonald's hamburgers Massachusetts efficiently produces a socially un-nourishing mass solution to domestic violence. The sad thing is that these restraining orders are used to keep innocent loving fathers from seeing their children. As a result we are raising many Massachusetts children on a single parent diet, malnourished them, by denying them a staple of human development, Fatherhood. Glen Sacks wrote a column where he quoted Elaine Epstein, former president of the Massachusetts Women’s Bar Association, stating that restraining orders are doled out "like candy" to “virtually all who apply," and that "in virtually all cases, no notice, meaningful hearing, or impartial weighing of evidence is to be had."